Nick Palma moved all in over the top of another player's open. Nick's opponent made the call holding pocket tens, and Nick would be racing for his tournament life holding ace jack. The board brought no help, and Nick will be eliminated in 18th place, just shy of the money. With the elimination of the 19th place finisher, the final 18 are redrawing for seats at the final two tables. There are still 13 minutes and 40 seconds left in 1,500/3,000 with a 400 ante, then there will be a break and one more level before finishing for the night. The field has been trimmed down to 30 players, and they are now on a 10 minute break. Still alive in the field are Mark Dube, Tom Dobrilovic, and Nick Palma, among others. Cards are back in the air for Event #4 $500 NLH. The field will play 7 more levels tonight before bagging up and returning tomorrow at 12pm. Blinds are now 500/1,000 with a 100 ante. Players are now on their one hour dinner break. When they resume, blinds will be 500/1,000 with a 100 ante. Play will resume at approximately 7:30pm EST. Level 8 is complete which means players are on their third break of the day. The 25 chips are being colored up and raced off, and registration will close at the end of the break. Currently the board reads 127 entrants with 80 remaining. Cards are in the air for Event #4 $500 NLH. This tournament features a $50,000 Guarantee and has a 20,000 starting stack and 40 minute levels on Day 1. A full structure sheet is available here. At 12pm, Event #5 $300 Seven Card Stud 8+ will begin. 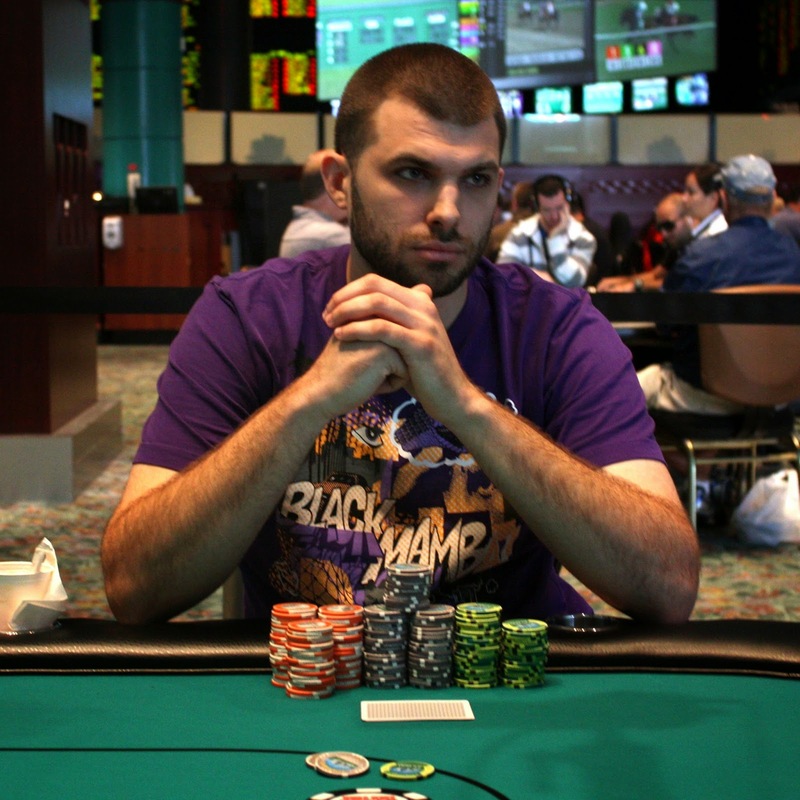 This tournament features 10,000 in starting chips and 30 minute levels. A full structure sheet is available here. Event #2 $300 NLH Bounty is down to the final 5 players. They are currently playing 12,000/24,000 with a 4000 ante, and in 5 minutes there will be a break. 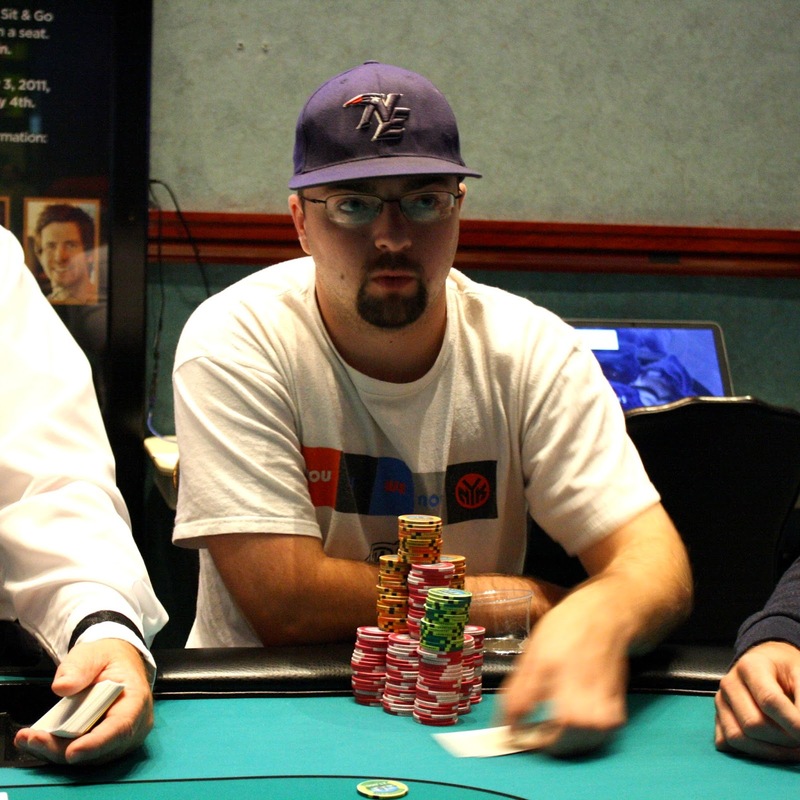 Event #3 $300 Omaha 8+ is down to the final 6 players. They are currently on break and will be playing 15,000/30,000 limits when they return. After being down to 600,000 heads up against his opponent's 7.6 million, Rory Anderson mounted an amazing comeback to win Event #1 $600 NLH. 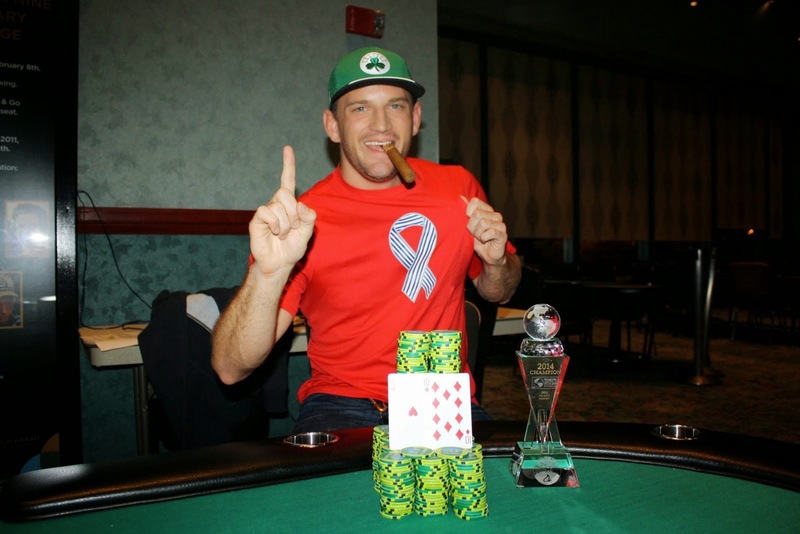 On the final hand, Rory's [Ah][Td] bested Peter Wagner's [Kc][8c] after a preflop all in. The [6d][4d][3s][9d][7d] kept Rory's ace high in front to collect the last of his opponent's chips. Rory will collect $46,568 for his 1st place finish along with the World Poker Finals trophy and title, Rory explained he doesn't play tournaments often, and winning the title after having such a huge chip deficit makes the win even sweeter. In Rory's winner photo, he proudly displayed his ALS Challenge T-Shirt as his friend popularized the viral sensation. He will certainly go enjoy the cigar he's been chomping on for most of this final table, and his earlier statement that he is the best player in the room can currently go unchallenged. Congratulations, Rory.